My mission as a teacher guides everything that I do both inside and outside the four walls of the classroom. When the going gets tough, my mission is what inspires me to carry on because I know that my students need me to make their lives better. My mission is encapsulated in this statement to provide a nurturing, safe, and healthy environment for learning to enable my students to realize their full potential. I try to forge respectful and meaningful relationships with students, their parents or guardians, my fellow teachers, the school administration, and the other members of the school community. I honor, respect, and respond to differences and similarities, especially in terms of opinions. Second, I endeavor to create a community of learners who are supportive and encourage successful learning and harms the feeling of safety that I want my learners to have in school. Furthermore, I try to develop myself as a competent educator who meticulously designs, plans, studies, and evaluates instruction. I do my best to communicate effectively and clearly, and attempt to solve problems creatively through the tools provided by the contemporary times. I never come to school unprepared, knowing that my students depend on me to make their learning experience smooth and enjoyable. Lastly, I collaborate with other professionals. 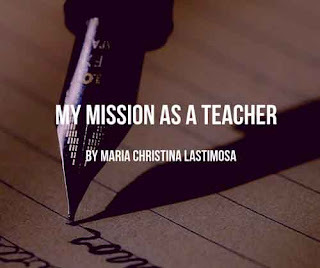 As much as possible, I use the best practices for instruction and assessment as determined by others who are ahead of me, such as researches, other teachers, and other experts, in the field of education. The goal of my teaching is in line with DepEd’s aim of developing lifelong learners. When achieved, this goal, along with my personal mission, will help everybody to not only contribute, but also lead our society.